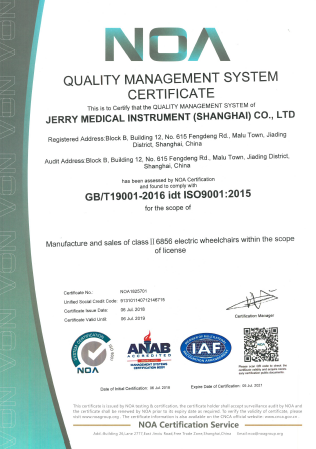 Company Overview - Jerry Medical Instrument (Shanghai) Co., Ltd.
5YRSJerry Medical Instrument (Shanghai) Co., Ltd.
Jerry Medical Instrument (Shanghai) Co.,Ltd is a professional high-tech manufacturer specialized in R&D,production and sales of medical instrument including,electric wheelchair,elderly scooter. Equipped with strong personnel and scientific management system, Jerry became one of the most competitive enterprises in the field of electric wheelchair that challenges foreign products of the type.Current products are categorized into two series,namely,electric wheelchair(D series),elderly scooter(B series).As an ambitious company, Jerry sticks to the enterprise purpose of Honesty,takes initiative to assume corporate social responsibility, and actively participates in charity causes. In contributing to the improvement of the quality of life among people with disabilities and the elderly in China, Jerry has been progressively moving toward the objective of building domestic leading brands in the wheelchair and elderly scooter markets.Corporate Objective: to build a national leading high-tech enterprise with world-class products of High Technology & High Quality in the electric wheelchair and elderly scooter markets. Corporate Philosophy: changing and innovation,in pursuit of excellence, integrity-based,creating value for customers,improving self-confidence of people with disabilities and enabling their self-care capacity, improving the quality of life among the elders,creating value for employees,and providing employees with a successful career, increasing wealth,and better quality of life.